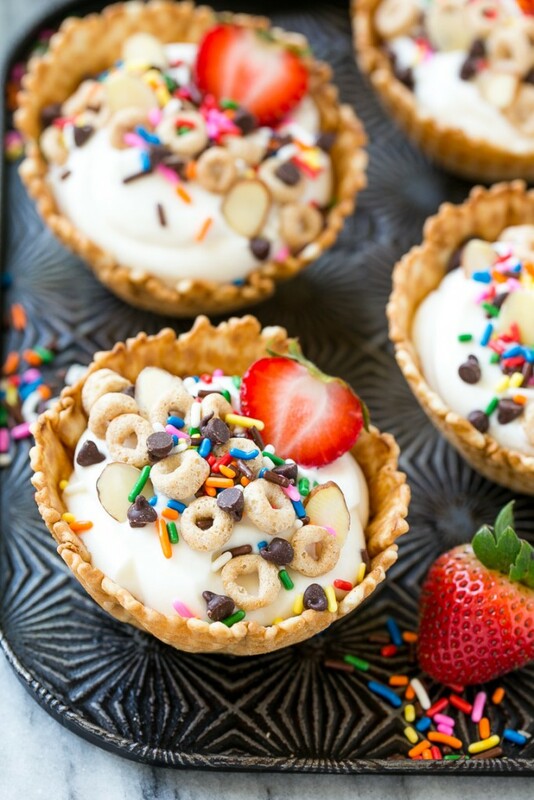 This recipe for breakfast sundaes is waffle cone cups layered with fresh fruit, Cheerios™ cereal and yogurt, then finished off with an array of fun toppings. A great way to make breakfast special! 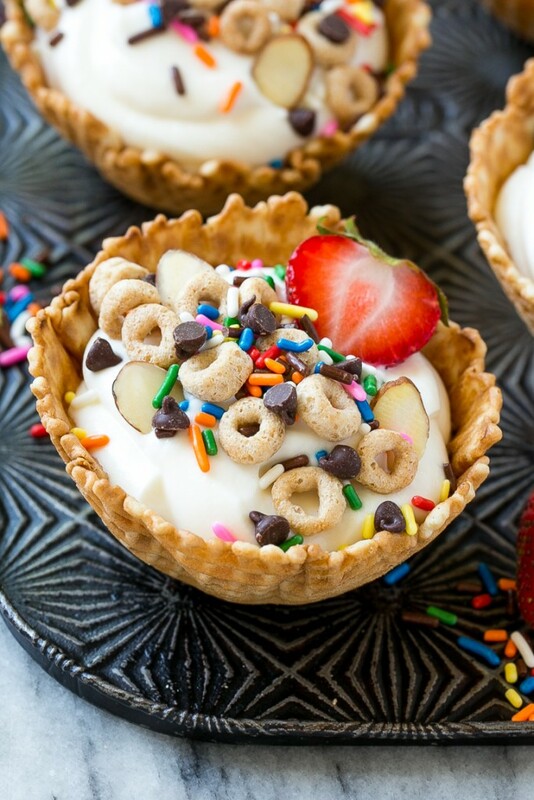 I love quick and easy breakfast options, some of my favorites include baked oatmeal cups, breakfast burritos and these adorable breakfast sundaes. We have definitely been enjoying summer so far – lots of time in the pool, at the park, we went to the zoo this week, and plenty of time has been spent just hanging out. Now that we don’t have to rush out of the house in the morning, I’ve been taking the time to make more elaborate breakfasts. I came up with the idea for these breakfast sundaes on a whim, and let me say, they’ve been a HUGE hit! Best of all, you can get the kids involved in the creation of these fun little treats. How do you make breakfast sundaes? This recipe starts with waffle cone bowls. These bowls are sold with the regular ice cream cones at most grocery stores. 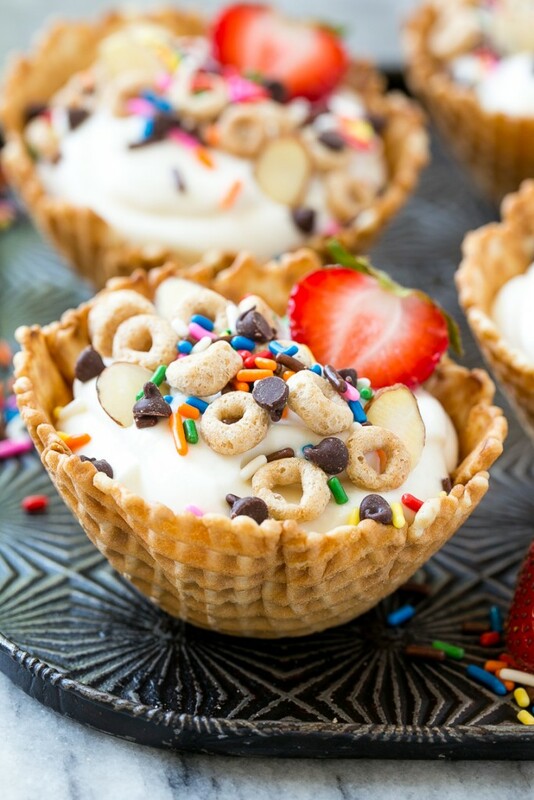 The waffle cone bowls are filled with layers of chopped fruit, Greek yogurt and our favorite Cheerios™ cereal. I buy my Cheerios™ cereal at Walmart, they always have a great selection of all the different flavors. You can really use any type of fruit and yogurt that you like. I did a combination of diced strawberries, bananas and blueberries. I like to use vanilla yogurt in these breakfast sundaes because it’s a more neutral flavor that goes well with all of the toppings. I must say, the toppings are my kids’ favorite part of these breakfast bowls. I went with a combination of Cheerios™, mini chocolate chips, sprinkles and sliced almonds. You can mix up the toppings a bit by adding ingredients such as dried fruit, other types of nuts, or even shredded coconut. I put out all the ingredients and let my girls assemble their own breakfast sundaes, they thought that was really fun and they were so proud of their creations! These breakfast sundaes are a fun activity to get your summer days off to a great start! I’m already thinking up other fun breakfasts to make with the kids during our stress-free summer mornings. I’ve even included a video to show you just how easy these treats are to make! 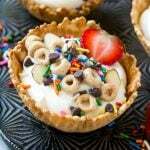 This recipe for breakfast sundaes is waffle cone cups layered with fresh fruit, Cheerios™ cereal and yogurt, then finished off with an array of fun toppings. A fun way to make breakfast special! Divide the chopped fruit evenly among the bottoms of the waffle bowls. Top the fruit with 2 tablespoons of Cheerios™ and then add 1/2 cup of Greek yogurt over the cereal. 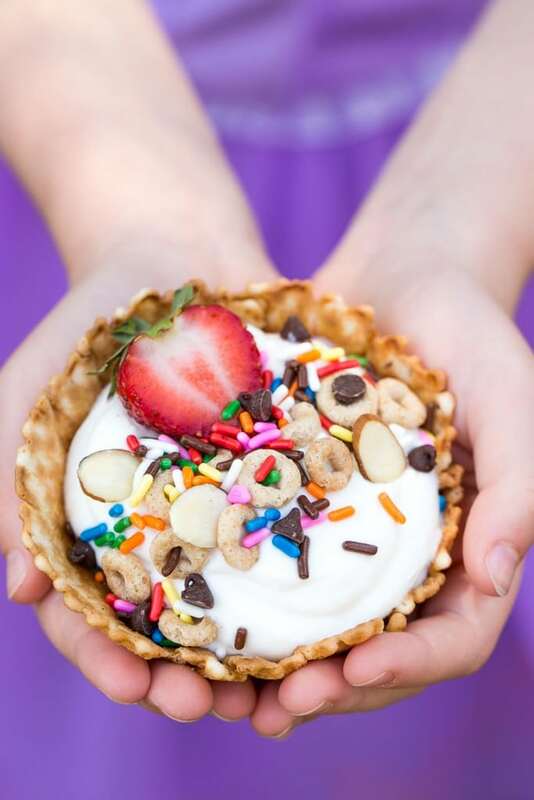 Sprinkle the remaining Cheerios™, mini chocolate chips, almonds, and sprinkles over the tops of each waffle bowl. Garnish each bowl with a strawberry half and serve immediately. This post is sponsored by Cheerios™. Thank you for supporting the brands that make Dinner at the Zoo possible! 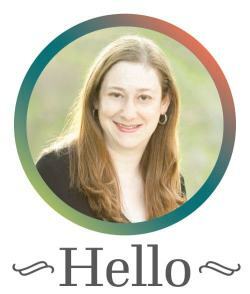 So love this idea! Making these for the first day of school next week! 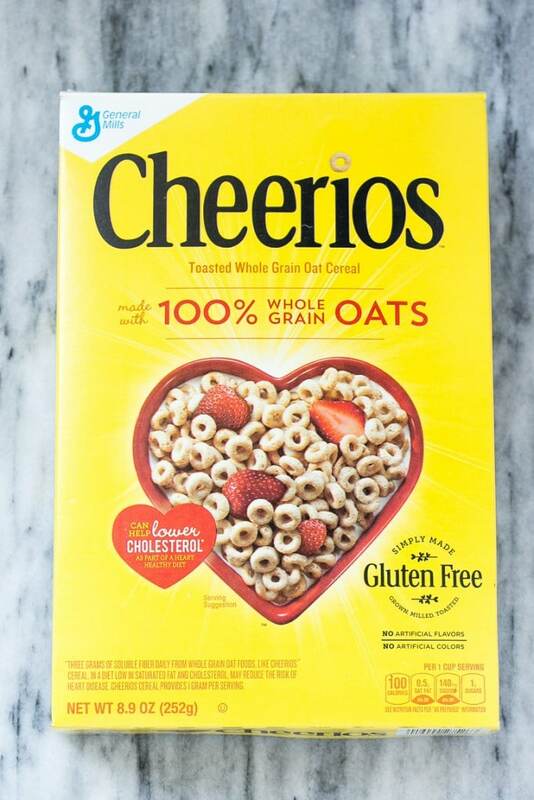 These look so yummy and my kids love Cheerios! Telling the kids they’re having sundaes for breakfast must generate a lot of excitement – brilliant idea! My girls would have loved this breakfast treat! How fun are these and I always have Cheerios in the house! My husband eats them for breakfast every day! I can see why kids would love these, especially if they get to help make them! Yogurt and Cheerios is one of my favorite breakfasts – with a little drizzle of honey but now I want to eat it in an ice cream cone! This is completely brillant – no clean up because you can eat the bowl. I bet your girls loved them. Have a wonderful weekend! These would also work in waffle cones, and easier to hang on to!